“Like I said before, you have no control over what situation you’re born into.” (Location 2151). When a meteor is about to wipe out humanity as we know it on Earth, a select number are gifted the chance to live underground and continue the human race as natural disasters destroy everything aboveground. Decades after this decision, and the lottery to get a chance to survive below, there is a distinct segregation of class between the Tri-Realms: Sun Dwellers have all the power and most of the electricity and resources, Moon Dwellers live further down while the Star Dwellers live the furthest from the surface and suffer the most at the hands of those above. The Moon Dwellers centers on two main characters, Adele from the Moon Dwellers and Tristan, the son of the ‘President’ from the Sun Dwellers. Adele is thrown into juvie after her parents are accused of treason against the government. Tristan is next in line to inherit the power to control the Tri-Realms, but he is disgusted by the inequality and finds his chance to rebel against his father when he first sees Adele. There is something that draws them to each other and for Tristan, finding out who she is brings him out of his comfort zone and into the plot of something much more sinister. For Adele, she is focused on escaping her prison and then reuniting with her sister and parents. I loved this book. It had a kickbutt girl character, a romance that wasn’t in the forefront of the plot, some dystopia and post-apocalyptic living, a corrupt government, the underdogs fighting for justice, POV change done well, subplots and characters with their own stories intertwined in the main plot, a good ending with a lot left open for the next book in the series, emotional highs, a good blend of action and story, excellent descriptions, etc. I find it fascinating the reason for the apocalypse was a natural disaster (meteor). Humanity was saved by going underground, but not all of them could fit, therefore the world started over at Year Zero. The concept for the Lottery was well developed. The beginning of the book featured a brief history that was highly useful in getting an understanding of what was going on in the post-apocalyptic world. I really appreciated Estes putting this info in the very beginning of the first novel of the series. Throughout the book Estes blended his action with his story to have a very well-spaced plot that moved along at a good pace. 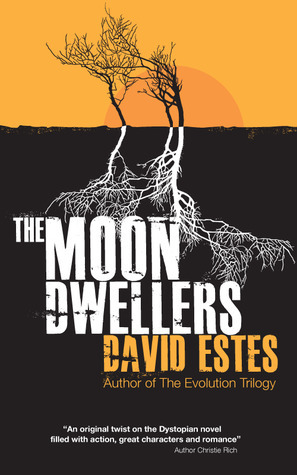 The descriptions the author used were excellent and stayed in character in the post-apocalyptic world Estes has created. The POV switching from Tristan to Adele from chapter to chapter was an excellent addition to the story and worked well. I thought it was excellent to make the two main characters have equal parts and equal abilities. It was a very balanced romance and I can’t say enough how much I wish more authors would make their main female and main male characters as equal as Estes has done. This novel was published through Createspace Independent Publishing Platform 06/27/2012 and is available on Amazon here.